Can one very determined libertarian and one very distorted version of history keep millions of people from getting health insurance? We’re about to find out. 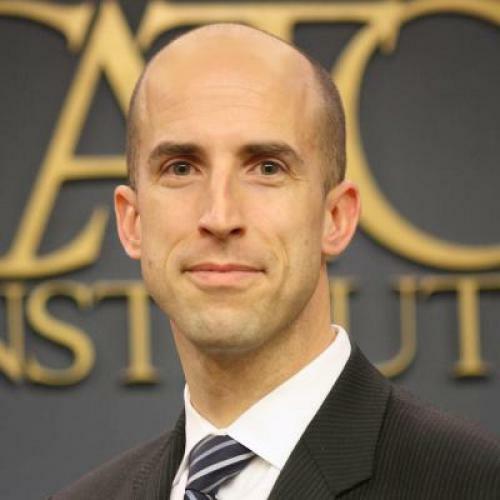 The determined libertarian is Michael Cannon of the Cato Institute. He was among the most vocal opponents of the Affordable Care Act, going back to the time when it was still a glint in the eyes of Ted Kennedy. The idea of universal coverage is so antithetical to Cannon’s principles that he actually started an "Anti-Universal Coverage Club." Once the law passed and took on the moniker "Obamacare," Cannon became a leading advocate for its repeal. And since he understood the law might survive both the courts and the 2012 elections, as it eventually did, he also made the case that states should avoid complicity in its implementation—and, if possible, actively thwart it. He made that case in his writing and speeches, sometimes directly to the officials with responsibility for implementing the law. One of the arguments he’s made is a legal one, the result of a collaboration with Jonathan Adler, a widely cited libertarian law professor at Case Western University. The state of Oklahoma has filed a lawsuit in federal court, making the same essential case. (I haven’t been able to establish to what extent, if any, Oklahoma officials relied on the Adler-Cannon brief, but the arguments are very close. And no single individual has done more to make the case for state resistance to Obamacare than Cannon.) Note that the lawsuit doesn't have to succeed to cause trouble: Merely by emboldening state officials hostile to the law, it could make implementation, already a challenge, even more difficult. The legal argument focuses on Obamacare’s insurance exchanges—the new marketplaces where people without access to insurance will be able to buy private coverage on their own, regardless of pre-existing medical conditions and with the help of federal subsidies. The law calls upon states to create and operate exchanges, so that coverage is available starting on January 1, 2014. Anytime a state fails to do so, the law says, the federal government should create and run that state’s exchange instead. About these facts, there is no dispute. The question is whether, when running an exchange in lieu of a state, the federal government can operate it in the same way—in particular, whether the federal government has authority to offer those subsidies. These tax credits, available to people on a sliding scale depending on income, will be worth as much as several thousand dollars a year in some cases. They will enable millions of Americans to get comprehensive health insurance, the kind they cannot now because the coverage is too expensive or simply unavailable. Without the subsidies, these people couldn’t get coverage and, quite possibly, the exchanges as a whole would cease to function because they could not maintain a good actuarial balance. The language, structure, legislative history, and congressional debate over the PPACA demonstrate that its authors preferred state-run Exchanges to federal Exchanges. From the outset, the Act directs states to establish Exchanges and many PPACA’s supporters presumed that all states would create exchanges of their own. While the Act authorizes the federal government to establish Exchanges for states that fail to comply with the PPACA’s direction, these exchanges are intended to serve as a fallback, and were not intended to replace state-run exchanges. The emphasis is mine, because this is really the heart of the case. According to Cannon and Adler, the Senate wanted a system in which states that failed to create exchanges could deprive their citizens of subsidies. If Congress had meant to limit premium subsidies to state-established exchanges, as an incentive to States, one would have expected the Finance Committee report … to have mentioned this, and for at least one Senator to have pointed this out during the debate in November and December 2009. Most importantly, the Congressional Budget Office (together with the Joint Committee on Taxation) provided Congress on November 30, 2009, an analysis of the impact of the legislation on premiums that assumed that premium tax credits would be available in all states, making no distinction between federal and state exchanges. Over the next few days, this analysis was discussed by Republican Senators Grassley, Enzi, and Coburn. None raised what Cannon and Adler see as an obvious point, that the CBO analysis was flawed because it failed to recognize that premium tax credits would not be available though federally facilitated exchanges. In responses to Jost and Bagenstos, Cannon has suggested that they cannot back up their inferences about intent. I think they have, but I can add some material, as well. I covered the debate on health care reform from first stirrings of activity in early 2008 to the day President Obama signed legislation at the White House. The debate over whether to have federal or state exchanges was contentious alright. In fact, it was one of the key divisions between the Senate and the House. But everybody always assumed that, if states chose not to create exchanges, the federal government would step in and do the job completely. The idea that a state could deny its citizens insurance subsidies by choosing not to build an exchange is simply not an option the law’s architects ever contemplated. Another reliable source on the issue is Liz Fowler, who was Baucus’ senior health care adviser on the Finance Committee. While it was President Obama and Democratic congressional leaders who made the big decisions on health care reform, it was a tiny handful of administration officials and senior congressional staff who actually wrote the bills that became final legislation. Fowler was one of them. In fact, she is probably the single most authoritative judge of what her boss and his committee colleagues intended the law to say. The fate of the case won't rest simply on the debate over congressional intent. Among the other issues is standing—specifically, whether Oklahoma can even bring this lawsuit. (The federal government just filed a brief challenging that.) But it's Cannon's congressional intent argument that I find most baffling. I’ve known Michael for a long time. He is smart and congenial, his belief in libertarian principles utterly sincere. Maybe he simply sees things differently. Or maybe he has convinced himself of this reality, because he wants to believe it, as people have been known to do. I honestly don't know. Whatever the explanation, he's a private citizen and entitled to his opinion. The public officials who have signed onto this crusade are another story. I can’t read their minds, but I'm skeptical that all, or even most, of them honestly believe the Senate intended to give them this sort of discretion. More likely, they see this as an opportunity to thwart a law they oppose—and, perhaps, curry favor with conservative voters or funders. Either motive would violate the basic oath most of them take, pledging to execute the laws in good faith. If these officials don't like Obamacare, they can criticize it and campaign for representatives in Washington who would repeal it. But as long as Obamacare remains on the books, these officials also have to implement it—just as surely as they implement the minimum wage, environmental regulations, and any other liberal measures they similarly detest. Their first obligation isn't to their ideology, philosophy, or party. It's to the country and that means to enforce its duly passed laws.